The future is Ergohuman – designed with total comfort in mind. The Ergohuman chair is a perfect fusion of art and science, with flex zones that ensure constant support of back and lumbar, multi-dimensional adjustable arm rests for unparalleled support and a height-adjustable pivoting headrest for full cranial support. The Ergohuman has been designed specifically for those who are in an office chair for long periods of time and require “Intensive Use Seating” to keep them comfortable. 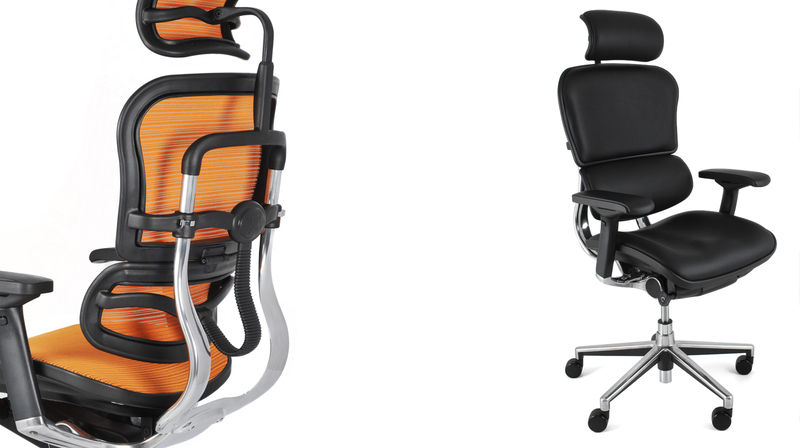 Aesthetics, form and function allow this ergonomic chair to utilize a synchro tilt mechanism with 3 positional lock, sliding seat, pneumatic height adjustment, automatic lumbar support system, height and angle adjustable arms and headrest all in one very unique ergonomic chair. The Ergohuman also boasts 97% recyclability, has Greenguard Indoor Air Quality Certification and meets EN 1335-2:2009 and EN 1335-3:2009. Available in a choice of mesh, fabric or leather with polished aluminium frame and base.